The Emerald Coast of Florida is a beautiful stretch of beaches from Panama City, Florida to Pensacola, Florida. The beaches are characterized by sugar white sands and crystal clear water. Communities that dot this coast include (from east to west), Panama City, Seagrove, Grayton, Blue Mountain, Santa Rosa, Dune Allen, Sandestin, Miramar, Crystal Beach, Destin, Holiday Isle, Fort Walton Beach, Navarre, and Pensacola Beach. The most populated areas are Panama City, Destin, Fort Walton Beach and Pensacola Beach. There are five primary counties whose southern boundaries are the Gulf of Mexico; Escambia, Santa Rosa, Okaloosa, Walton and Bay. 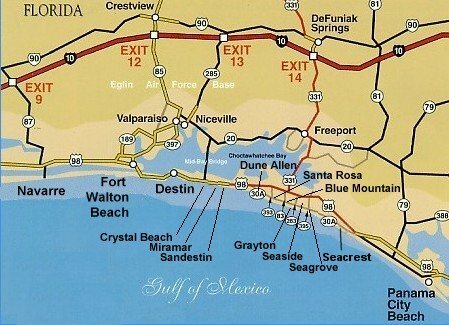 Vacation rental properties can be found all along this coast. The more populated areas feature easy access to a variety of activities like golf, fishing, scuba, shopping, restaurants and night life. However, it is relatively easy to find a rental property that will get you away from it all. There is no place along the Emerald Coast where you are more than 15 minutes away from something to do - other than the beaches. Properties for rent come in a wide variety of configurations. There are houses, townhouses, condominiums, villas, bed and breakfasts, etc. The amazing variety of amenities is impossible to list here. At BeachBreak, all of the properties listed are very close to the beach or are directly water front. We do not represent just one property manager or agency. As a matter of fact, Beachbreak contains rental properties from over 20 agencies along the coast. All of the listings here have photos or images that let you have a good idea of what the property looks like. We also feature a "Wish List". As you browse through the rental listings and when you find one that you are interested in, you will be able to ADD these properties to your "Wish List". When you are finished browsing, you can submit your Wish List to BeachBreak and we can let you know if the vacation property is available for your dates of travel. The Emerald Coast used to be a quaint retirement retreat area where the main attraction was the fantastic fishing. However, over the last 10 years, the area has become one of the most popular vacation spots in Florida and the southern United States. There are still fish here - winter, spring, summer and fall , so come help load up the barbie-q and have some fun in the sun!